Smarter Loans > Canada is a global financial industry powerhouse; so why isn’t its FinTech sector? For a relatively small country, Canada punches well above its weight class in the financial industry. Not only is the country home to some of the world’s biggest financial institutions, it’s also home to some of the most stable, as demonstrated by their resiliency during the global banking crises of 2008. In fact, of the world’s 20 largest banks by market capitalization, three are based in Canada, with most of the remainder scattered between the United States, the European Union and China. Graham, however, went on to explain to the audience gathered at the MaRS Discovery District that Canada’s FinTech industry hasn’t yet enjoyed the same level of influence. Comparing his list of the world’s biggest financial institutions to a list of privately held FinTech unicorns (or financial industry startups valued at over a billion dollars), many of the same countries appear. 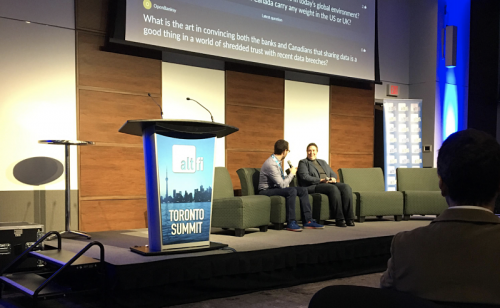 The imbalance between the relative successes of Canada’s major financial institutions and the relative anonymity of its FinTech sector was a key area of focus throughout the daylong AltFi Toronto event. The stage played host to a range of experts from tech and finance, from Canada and abroad, each offering their thoughts on why the country’s FinTech industry is lagging behind, and how best to enable it to catch up. Are Canadians ready for FinTech adoption? As the home of three of the world’s top 20 banks by market capitalization, Graham suggested in his opening remarks that perhaps Canadians don’t really need FinTech the way other markets do, as their financial needs are already being well served. “Canadian consumers—perhaps because we have such a strong banking system—have been slower to adopt FinTech,” he said, citing EY research that showed the country lagging far behind the rest of the world in FinTech adoption. “This is a little strange, because when it comes to technology more broadly, Canada has been a very rapid technology adopter,” he continued, explaining that Canadian Internet and social media usage outpaces most other major economies on a per-capita basis. Graham went on to explain that despite being a relatively tech-savvy nation, Canadians already have access to world-class financial institutions that enjoy strong customer loyalty, especially compared with other countries. So why bother focusing on developing our FinTech industry here in Canada? Graham gives two important reasons. “As strong and stable as the Canadian banking system is, there are big opportunities for Canadian consumers to do better,” he said, citing relatively high prices for financial services, speed of transfers and a lack of competition. 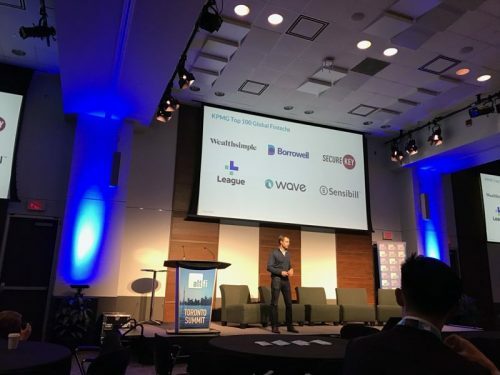 Throughout the day, speakers from a range of FinTech backgrounds acknowledged the success that traditional financial institutions have had here in Canada, explaining how difficult it is for innovative, alternative solutions to earn market share. When compared to other jurisdictions that are surpassing Canadian FinTech innovation by leaps and bounds, one element that many have in common is open banking policies that allow third parties to access consumer financial information. Europe’s open banking policy—known as the Payment Services Directive or PSD2—came into effect earlier this year, and speakers suggested similar policies would help stimulate FinTech innovation in the Great White North. Wong explains that open banking has reduced a lot of friction for digital financial service providers in Europe and elsewhere around the world, adding that similar products in Canada are more clunky for users without it. “Today, with online lending [in Canada] you still need some sort of proof of bank account, a lot of the times people are also still asking for paystubs, for paper documents that need to be reviewed,” she said. Those extra steps ultimately make the FinTech option more cumbersome than traditional alternatives, explained fellow panelist and vice president of partnerships and capital markets for OnDeck Capital, Amar Ahluwalia. Ahluwalia adds that open banking would be “game changing” for the FinTech industry in Canada, allowing providers to offer “bespoke” solutions to customers, tailored to their individual needs. “For example, a restaurant, having the ability to have flex payments tied to the performance of the restaurant would be really important to them,” he explained. Not only would open banking empower FinTech startups to compete on the same playing field as major financial institution incumbents, but it would also help prop up other members of the finance ecosystem in Canada. “I love the big five banks, they’re all awesome, but the next level, the challenger banks, the credit unions, the financial institutions that are far more focused on member experience, having an open banking data policy is going to allow those guys to provide some game changing innovative products, and create a banking ecosystem in Canada that is much better for all of us,” said Ahluwalia. Canadian regulators’ hesitation towards pursuing an open banking policy, however, is not unfounded. While speakers were enthusiastic about the opportunities an open banking policy would bring to the industry in Canada many also expressed a need for caution. After all, recent history has proven time and time again what can happen when consumer data is no longer locked away in a digital bank vault. Despite what Mitelman would characterize as reasonable concerns about the prospect of open banking he explains that the FinTech industry is currently operating on information from the past; open banking would allow them to start working in real time. “When you get access to real-time data, as opposed to using something that happened in the past—a financial statement or some proxy to cash flow—you get to make decisions that are so much more appropriate,” he said. For the mean time, FinTech companies in Canada are finding workarounds, but sourcing the data they need to offer their products remains far more complicated and costly than it would be under an open banking system. Canadian regulators are in a tough position when it comes to open banking, as it can open the floodgates to a better, more user-centric and innovative financial technology industry, but also instances of fraud, hacking and data theft. Credit Karma’s chief revenue officer and co-founder, Nichole Mustard, believes that Canadians will come to terms with the risks and benefits of open banking, much like they have other technologies in recent years. She explains that the concept of getting into a stranger’s car was foreign only a few years ago, as the concept of autonomous vehicles remains today. Before she trusted Uber and Lyft, however, she learned to trust mapping application like Google Maps to find her the best route home. Only once she was comfortable with that layer of technology were consumers ready to take it one step further by adding a car and driver to the equation. Mustard adds that it will take some time for the financial industry to earn that same level of trust, but believes the more we utilize digital financial services, the more we trust them to operate autonomously, without asking for our permission and personal information with each use. When it came to assessing the government’s job in supporting the FinTech industry in Canada, speakers and panelists applauded their willingness to consult with industry players in order to build a regulatory framework, but felt that framework was coming together too slowly to match the pace of innovation. Mitelman agrees, adding that while the dialogue with the federal government of Canada is healthy and productive the industry is yet to receive any real government support. One of the ways in which a small amount of government support would go a long way is access to data, explains Mitelman, specifically the Canadian Revenue Agency’s data related to income and taxation. “If we did nothing but think about how to unlock that data and make it available in a dynamic way, the number of entrants to the market that you would see would be exponential,” he said. The co-founder and CEO of financial data provider Flinks, Yves-Gabriel Leboeuf, however, said the industry should put equal if not greater focus on the Competition Bureau, as regulations currently provide unfair advantages to traditional financial institutions. 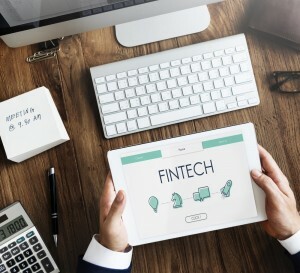 Despite frequent calls for the government to assist in growing FinTech in Canada, Leboeuf doesn’t think they will be answered anytime soon, suggesting the industry should get used to operating without their help. “We should not expect the Canadian government to change everything to make everything perfect,” he said. With three of the world’s leading financial institutions and a booming technology industry, one might expect Canada to have a wealth of knowledge and expertise to bring to the global financial technology industry, but not all speakers felt the country had enough of a supply of talent to become a world leader in FinTech. “It’s not that I’m down on Canadian talent—I’m very bullish on tech and FinTech companies, I think there’s so much growth that’s just starting—I just don’t think there’s going to be the volume of talent that we need here,” said Wong of Borrowell. “There’s not nearly enough FinTech talent in this space to meet the need,” agreed fellow panelist Mitelman. Mitelman went on to explain how, as a company of a couple hundred, Thinking Capital has had to spend significant time and resources training and onboarding staff from adjacent industries. “That’s an enormous challenge, because the onboarding takes a long time, and you’ve got to go pretty deep to make it effective,” he said. 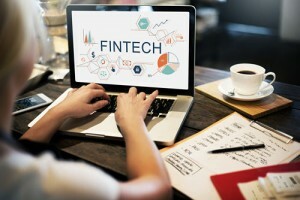 The other problem often faced by Canadian FinTech companies when it comes to finding local talent is the competition, as startups are rarely able to offer compensation packages comparable to what is offered by traditional financial institutions. OnDeck’s Ahluwalia, however, felt it was still better to start a FinTech company in a country that has strong financial and technical talent, adding that it’s not just banking executives that will help the industry flourish. What role can foreign FinTechs play in growing Canada’s ecosystem? Despite the challenge of finding qualified talent in Canada speakers representing international FinTech brands felt that industry players would be able to import the talent it needs from elsewhere around the world. Angus Sanders, the U.S. head of strategy and business operations for U.K.-based peer-to-peer lending marketplace Funding Circle, sees an inherent advantage for large companies that have human capital resources they can leverage from other markets. While the strategy can work as a temporary solution, however, Sanders and other panelists representing multi-national brands stressed the importance of also partnering with local talent before bringing their products into new markets. 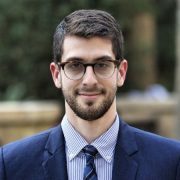 “We’re getting better at understanding the similarities between different markets, so we can start working with them more quickly, but it does take a bit of time to learn about data sources and how their system works,” said Sanders, adding that different countries also have strong cultural differences when it comes to credit and loans. For example, American small businesses often accept borrowing money as a necessary step in their growth and development, while small businesses in one of their other main markets, Germany, often see borrowing as a sign of weakness or desperation. Mustard of San Francisco-based Credit Karma refers to such nuances as the “localization twist,” which she says are vital for FinTech companies entering new markets, even across her country’s Northern border. Mustard explains that its important for international companies to maintain the competitive advantages that allowed them to be successful in their home markets, but also be prepared to adjust according to local needs and preferences. Even within her home country, Mustard says the company is making a deliberate effort to explore the diversity of its customer base by pushing away from the coasts and spending more time in Middle America. With all the resources that are lacking in Canada, some believe the country has to rely on foreign multinationals like Credit Karma to show Canadians what’s available, and what’s possible, from a healthier and more vibrant financial technology industry. Though speakers often had a direct interest in the strength of the Canadian FinTech industry many took a wider view, explaining how its growth could benefit other players in the ecosystem, and the country more broadly. Graham, for one, believes that the biggest beneficiaries of a strong FinTech industry in Canada are the traditional financial institutions. Despite the long-term benefit that a stronger FinTech industry could provide the established financial industry, however, some speakers felt there wasn’t enough of a short-term incentive to pique their interest in promoting open banking and other policies that would accelerate the growth of the FinTech sector. Equifax’s digitial innovation lead, Yassir Jiwan agreed with Eberhard, taking that sentiment one step further. 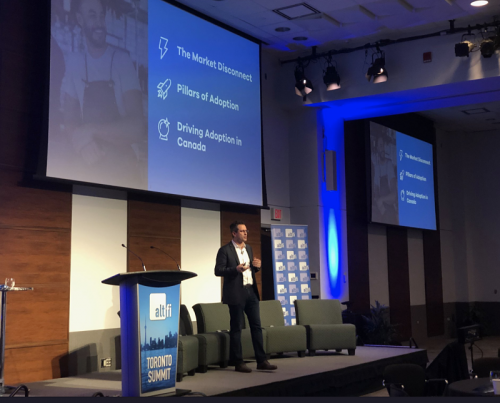 Further into the day, OnDeck’s CEO Noah Breslow made an announcement to the audience in regards to OnDeck combining their Canadian operations with Evolocity Financial Group. In this exciting move for both companies, the combined enterprise will offer a wide range of innovative financing options to the Canadian small business ecosystem. 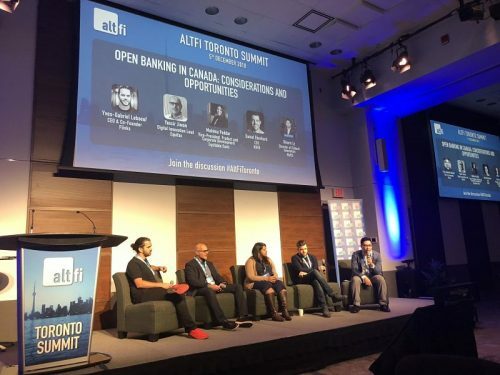 While the Canadian FinTech industry has many challenges to overcome—including consumer sentiment, access to talent, a lack of government regulation and no open banking policies—the main message many will take away from the Alt-Fi Toronto Summit is the importance of pushing forward. Not only will a strong FinTech sector benefit those directly involved, but it will also strengthen the country’s entire financial system, from the big banks and credit unions to the startups and individual customers.